Here's a superb new slot sites from the team at Elk Studios on Easyslots. Paso, Pepe and Pico, the heroic Taco Brothers are back again saving the towns tasty taco’s. However, Captain Diaz is still as persistent as ever, creeping through the Christmas snow of Santa Maria hoping to lock up the Brothers and that’s why they need you! Deposit and spin today to begin helping the brothers in their quest to save Christmas. Learn more EasySlots game from Elk Studios. The Game retains a similar feel to the original Taco Brothers but this time its Christmas in the Mexican outback, set 100 years ago. As you begin in your quest to help the Taco Brothers save Mexico from the evil Captain Diaz you’ll hear the occasional jingle of bells and see stunning visuals, with white snowflakes falling effortlessly on Santa Maria. Basic Wild Symbol – This can be used as substitute for any of the standard symbols to create the highest winning line up. Taco Brothers Wild – Commences a respin for the chance to line up three Safe symbols. If you manage to find three or more safe symbols this will grant access to the Wild Escape Bonus Game. 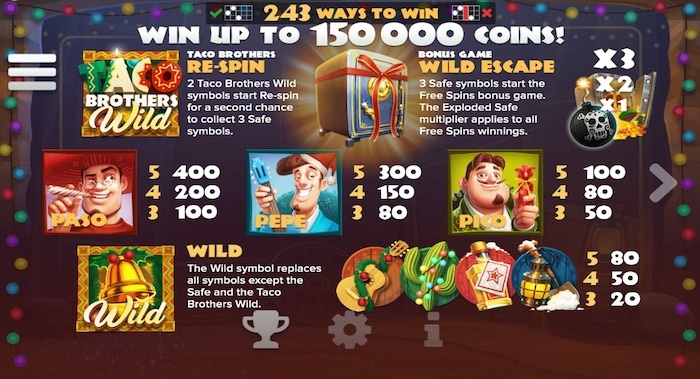 Wild Escape – The Brothers will be dropped one by one on reel 5, releasing Running Wilds, which move right to left, one reel per spin, replacing all symbols except for Captain Diaz and Senorita. The Wild Escape will only finish when all the brothers have escaped successfully. You’ll have to ensure Diaz doesn’t lock up all the Brothers or this will also end the game early. Although, luckily for you, Senorita is on hand to help as she holds the keys to unlock the Brothers and recommence the Running Wilds. Sign up today at https://www.easyslots.com and claim your free spins. 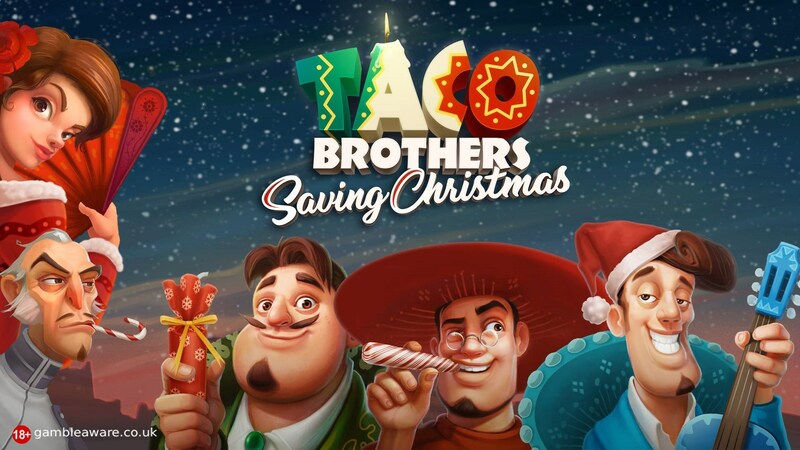 Taco Brothers Saving Christmas has followed on from what made its predecessor successful, simple gaming with an exciting, unique storyline. The cold winter has hit the usually sunny Mexico making the game refreshingly festive and an enjoyable experience if you’re tired of dull Santa-themed Christmas slots. With 243 ways to win and thrilling bonus game, there will be an abundance of opportunities to win big and small on the reel. If you’re interested in some of Elk Studios similar games why not try ‘Wild Toro’. 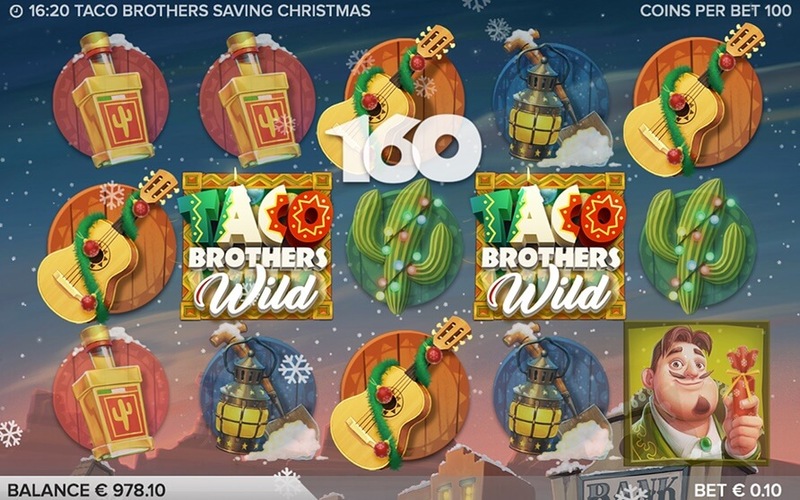 If you enjoyed Taco Brothers Saving Christmas then you might also like to try other popular slot games, visit the site here!